This following document describes how to use new experimental MapReduce-style stored procedures to execute distributed, analytical (OLAP) queries in H-Store. MapReduce-style transactions allow for H-Store to execute analytical queries that access the entire database without having to incur the cost of distributed transaction coordination. When executing normal distributed transactions (i.e., transactions that need to access multiple partitions), H-Store blocks other transactions that are running or waiting in the queue on other partitions and send all data it need to base partition. This has been shown to have a significant impact on the throughput of the whole system. With H-Store’s MapReduce transactions, the transaction is split into many single-partition transactions that will independently execute in parallel on all partitions. Although it is invoked as a distributed transaction that blocks all partitions, the PartitionExecutor will continue to execute non-MapReduce single-partition transactions and better performance has been proven. The transaction’s running at the base partition notifies all other partitions that to start the Map phase. The ExecutionSite at each partition will then invoke a single-partition transaction that executes the MapInputQuery that retrieves data from its local storage. These transactions run separately and do not need to coordinate with each other. These records are then passed to the Map() method of the MapReduce stored procedure. After the single-partition Map transaction finishes, it will automatically begin the shuffle phase in a separate, non-blocking thread. Data that has the same key which is defined in MapReduce stored procedure will be sent to the same destination (i.e. partition) from MapOutputTable to the input of the Reduce() method. After sending all the data to its destination, it will move to Reduce phase where the tranaction’s running at the base partition notifies all other partitions that to begin the Reduce phase. This is similar to Map phase when ReduceInputTable is prepared ready. Tuples in ReduceInputTable will be sorted by the key which is the first column by default. Tuples with the same key are then passed to the Reduce method of the MapReduce stored procedure. The output of the Reduce method at each partition is coalesced at the base partition for the transaction and sent back to the client. Note that H-Store will automatically partition the shuffle data using the first key of the Map’s emit table. This is very similar to MapOutputSchema.It defines what the output table schema of the Reduce method that will be sent back to the client. MapOutputSchema and ReduceOutputSchema can be very different for many other cases although they are more or less the same here. The Reduce() is invoked at each partition for processing the output data of the Shuffle method. There is not any need for users to care about the Shuffle function and the internal data send part. The input for reduce function is so well prepared by internal system that tuples with the same key can be accessed by the Iterator. This Iterator implements the Iterable interface but does nothing for remove() method. Last but not the least, the iterator should be also talked about. This part will be added later. Finally, there is a very simple MapReduce stored procedure class doing name counter called MockMapReduce for reference. This is the real demo implementation code for a simple MapReduce Stored Procedure. Distributed tested query 1 and test result figure can be seen next. This query is a good example to show MapReduce transaction has better performance than H-Store normal distributed transaction. 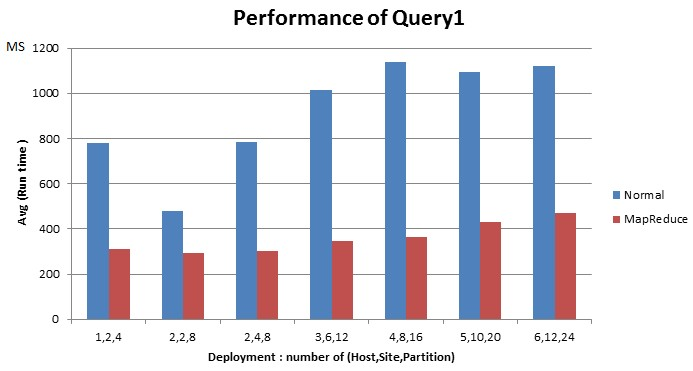 The X axis in is the Deployment of H-Store and the Y axis is the execution time of running Query1 in milliseconds. increases. Partition doubles does not indicates the input data doubles. However, we could know that the performance of MapReduce transaction will not declinegreatly than normal distributed transaction. Normal Distributed transaction will block other transactions on other partitions and send the data it needs to the base partition to do the aggregate operations which takes amount of time. MapReduce will treat it as many single partition transaction executed on each partition. After shuffle phase, all the data are well parted on each partition to do aggregate operation locally and partially, which seems to divide this task into every partition to do instead of a single base partition. 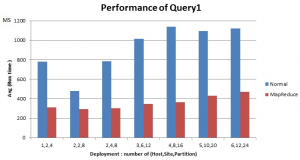 So the MapReduce transaction will definitely have better performance across the cluster. We would really like to how the data input scale affect the performance of these two kinds of transactions. By increasing the cluster scale with data input, I may test and prove the first conclusion in summary. Measure the effect of throughput on TPC-C instead of the executing time of these two kinds of transactions.